The world of technology is moving too fast. In this fast-paced and highly charged environment, every utility is gearing towards a future of smart technology. Information is at the core of this smart & cloud computing revolution in which highly filtered forms of data are being utilized to create future devices that are truly hi-tech. Through IoT (Internet of Things), Artificial Intelligence, Cloud Computing, Robotic Process Automation businesses and services are also aiming to achieve highly-customized experiences enabled by smart technology. 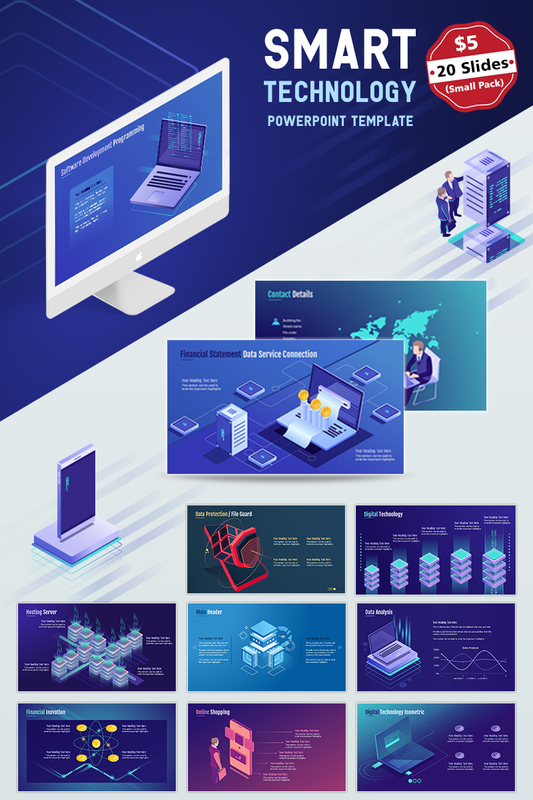 This template captures all aspects of information technology in a comprehensive manner, thus giving you an edge in all your IT business endeavours. The Smart Tech PPT Template (Small Pack) is extremely useful for IT Consultants, Project Managers, Solution Architects, IT Marketers, and IT Experts. The template is fully editable and can be customized according to industry and requirements. It finds application across industries for IT, Banking, Finance, Mobility, SaaS Solutions, Artificial Intelligence, IoT, Cloud Computing, Cloud Solutions, Big Data, Automation, Server Security and PaaS Solution companies. Apart from these, it is also useful for hosting companies, mobile app development companies, Fintech start-ups, web-app making company, mobile computing company, technology companies & startups.